When we first moved to Minnesota 41 years ago, we lived in a duplex. My neighbor in the downstairs unit is the one who helped me adjust to the nuances of Minnesota living. 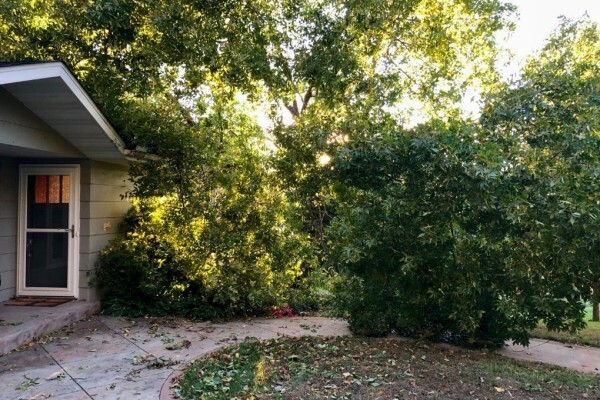 I’d grown up in California and was totally used to the idea of earthquakes, but the thought of living in a part of the country that dealt with tornadoes instead of earthquakes scared the daylights out of me. 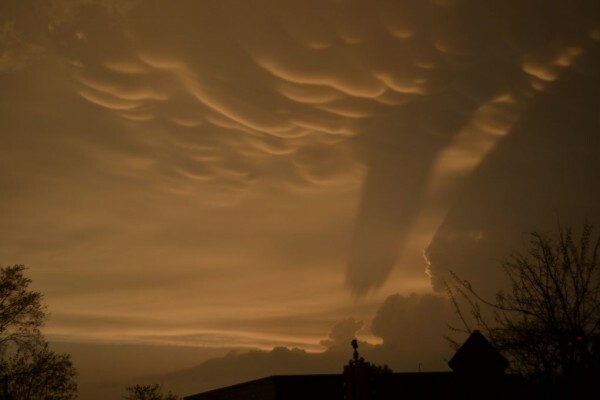 I shared my fear with my downstairs neighbor and she said, “Oh, don’t worry, there’s never a tornado where two rivers meet.” In our little southern Minnesota town the “Little Cannon meets up with the “Cannon River”—creating, I believed, a tornado free zone. So, good news, I thought, if I stay in the vicinity, I’m safe. Although that theory held for the past 41 years, let’s just say I’ve recently added it to the long list of old wives’ tales that aren’t true. On September 20, while John and I peacefully slept in Scotland, a tornado ripped through our little town. 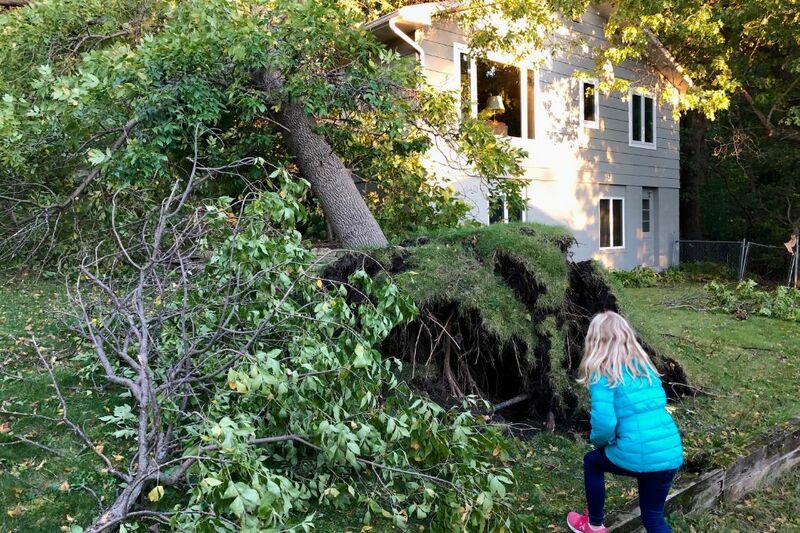 In total there were 16 tornadoes in Southern Minnesota that swept through an area approximately 8 miles in breadth by 75 miles in length. First off, no matter what you see on the television screen after a catastrophe of any magnitude, just know that it’s worse. 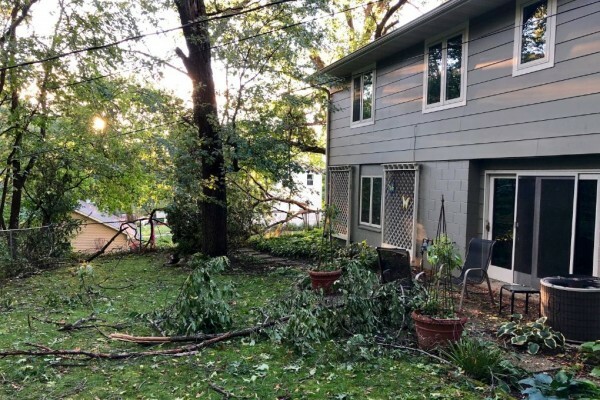 The pictures of the damage to our property didn’t begin to describe what all we’d have to deal with once we got home—and the damage at our house was minimal. What you don’t see in these pictures are the little tiny bits of twigs scattered all over the yard and embedded in the bushes. 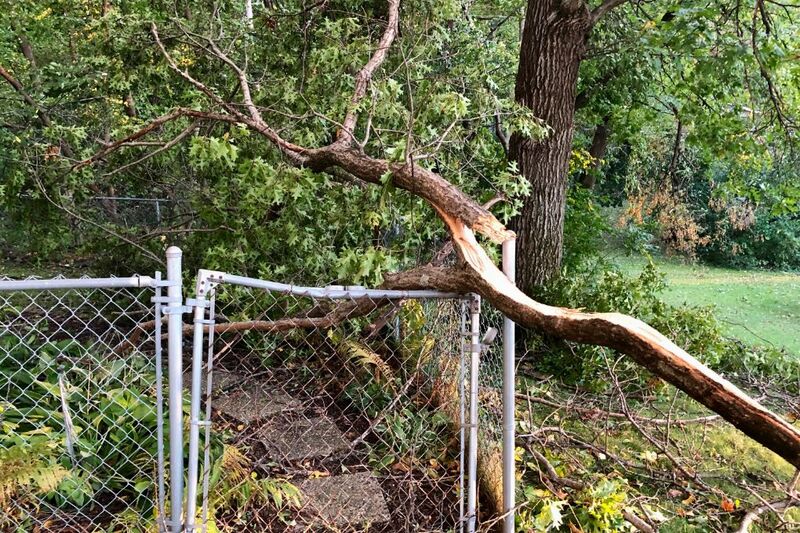 You also don’t see the time spent talking to our insurance agent, case lead, and adjuster, tree removal people, and Internet provider. You probably can’t tell, from anything other than my whining, that our Internet and phone lines STILL aren’t working—hopefully that issue will be resolved today. Again, these are all minor inconveniences. 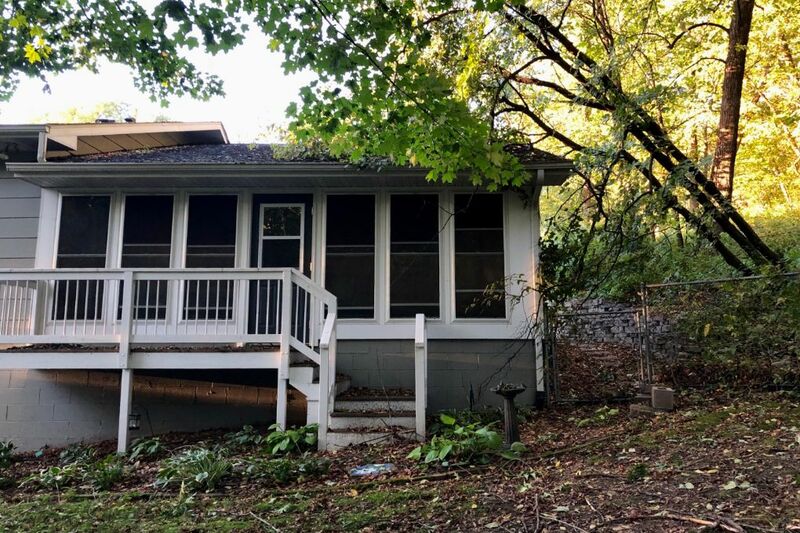 We are grateful there was no major structural damage to our house, and no one was injured in our city or any of the cities hit by the tornadoes. That itself is miraculous! Thankfully, since we were in Scotland during the storm and subsequent aftermath, we didn’t have to deal with the 48 hours of no electricity that affected most every town in the storm’s path. Nonetheless, I’ve listened to others tell their stories and realized that I’m vastly unprepared for such an event. Our son Paul offered to come to our house and rescue the perishable food from our refrigerator and freezer. Since we have a keyless entry on our garage door I figured we could just share the access code with anyone who needs to get in, which makes perfect sense WHEN THERE’S ELECTRICITY! Paul and I texted several times about potential ways he could access the house before I finally realized that we’d left our car (and keys) at his house. We’re geniuses. Ha! You’ve probably guessed from this information that my first tip is to make sure someone has a key to your house before you leave town for an extended amount of time. Of course, when you don’t have electricity, and the stores and restaurants are closed for the same reason, cooking can be problematic. So my second tip is to have some food on hand that can provide quick energy without being cooked. Alternatively, you could use a camp stove, a gas grill, or even a bunsen burner for cooking. Gas—third tip. I have a tendency to allow my gas tank to ride a little too close to empty. When I arrive home late at night I sometimes think to myself, “Oh, I have enough gas to get home and back to the station in the morning before I go any place. I’ll just fill up later.” As it turns out, gas pumps need electricity to work so if you plan to go anywhere more than five miles away (which could be useful if you ignore my advice about having food in the house), keep your gas tank full. It’s better for your car anyway. These are just a few things I’ve considered since hearing other people’s post-storm stories. If you have other tips I’d love to hear them because, as it turns out, tornadoes DO happen where two rivers meet. Thanks, Dorothy! I got my Internet back today so everything looks a little brighter. Amazing how something I didn’t even have 20 years ago is now imperative to my sanity! Ha! Humans desire agency, a mover behind each action. Nature often violates that desire, the agency being no more than chance. The St. Ansgar’s cemetery had most trees destroyed, while the city cemetery, but a mile away, had only a small percentage of its trees destroyed. The church and cemetery of Vasa has been hit hard by seemingly every storm of the past decade. If storms have a lesson to offer, one of them might be for humanity to take responsibility to smooth the bumps of a nature which can be simultaneously beautiful and randomly and brutally capricious. Thanks for your comments, Ken! I appreciate you reading my blog and taking the time to offer your thoughts.